There are times I go to bed with rooms in my house a total mess. I have those days just like everyone else. Here is an example. A few weeks ago, on a Thursday afternoon while my preschooler napped and my kids were at school, my living room was clean and tidy enough that I took pictures of it for the blog tour I showed last week. But then my kids came home and it was a crazy day. My husband coaches my 10 year old twins’ Lego Robotics team and their State Competition was that Friday/Saturday. The twins pulled out all the posters and robots and were putting last minute touches on everything all afternoon. Meanwhile I’m doing kid’s laundry (one basket at a time) and I get a terrible headache and slow down in productivity before any of it gets folded. Somewhere in there I made tacos, cookies, and helped the 8 year old get her costume ready for the wax museum at school on Friday. While my husband was with my twins at Robotics practice in the evening, my little man was being adorably reluctant to go to bed, so it was after 9 pm when the kids were down to bed. Then I tried to respond to some emails, cram in a little bit of writing, support people doing the Declutter Challenge in our Facebook group … still with a headache. So I left the Living Room a mess. Leaving any room a mess overnight is not normal for me, but it does happen. Life happens to us all, but perspective changes how we react to it. When I woke up on Friday morning to a messy Living Room, I did not feel like a failure. I can relate this to what a healthy person probably feels like the day they wake up after eating an indulgent desert. They probably don’t think “Darn. Now I’ve gained half a pound and failed and I’ll never be healthy. I give up on being healthy.” Hopefully when I say it like that it shows how crazy it sounds to me when I hear things like – “My kids have been sick this week and the rooms I’ve decluttered look messy again. I’m a failure.” I want to say WHAT?!?! The reason a healthy person doesn’t feel like a failure because of that one indulgent desert is because they know that they are going to go back to the habits that keep them healthy. That one desert will be a small enjoyable moment in their health journey. The reason I don’t feel like a failure when I wake up to a disaster living room is because I know that the mess is temporary. I know the Robotics Team stuff will get cleaned up over the weekend, I know the laundry will get folded, I know the pillows and blankets will make their way back onto the couch and all the other things that are laying about have a place to go and will be put away. But I do understand why the feeling of failure is so present on some of your minds. Organizing has not been your strength in the past. You don’t feel secure that everything will come back together when things get messy (and real life has lots of messes). 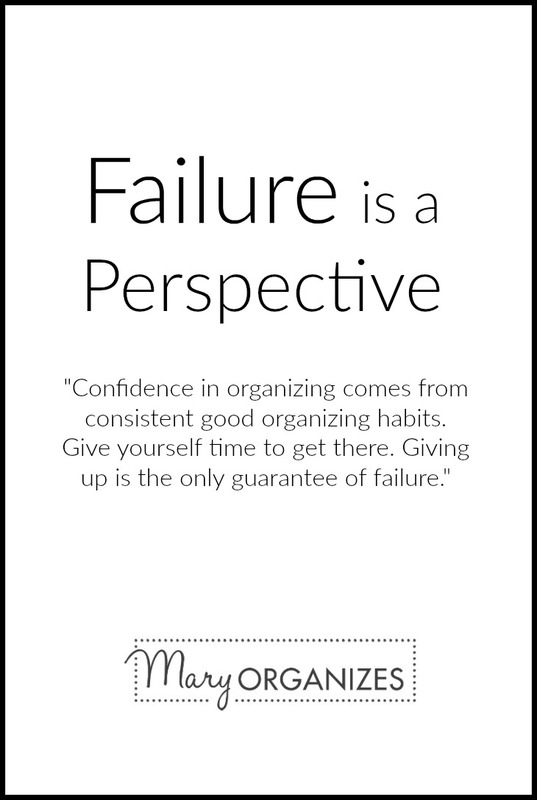 Confidence in organizing comes from consistent good organizing habits. Give yourself time to get there. Giving up is the only guarantee of failure. If you can commit to focusing on DECLUTTERING and going through this process with everything you’ve got, and not get caught up in organizing or decorating projects while you are in this phase, but focus yourself on truly ridding your home of the excess stuff that doesn’t belong there, you are paving the way for your future success. Because if your home is decluttered, you will be able to find a place for everything that you keep. And so when that one day in the future comes again and your bad day leaves you with a big mess, you’ll wake up the next day knowing that you can get it cleared up quickly. Wherever you are, start there. Probably you shouldn’t expect the house to stay perfectly clean while you focus on decluttering, especially if you’ve never built good organizing/ maintaining habits in the past that would keep it that way. This is when you just have to trust the process, and realize that before you can learn how to run, you have to clear a path to walk. Or in other words, before you’re going to be able to maintain a tidy home, you’re going to have to get rid of the clutter that is getting in the way of being organized. Life happening to us is not in our power to control, so it couldn’t possibly be our failure. We can only control how we react. Keep going!! Mary, it is 713am after our huge snowstorm outside, and I woke up feeling disheartened, because I felt I was feeling too overwhelmed, but then decided to take a look at my e-mails. I just read what you wrote, and it was just what I needed, to give me a renewed since of purpose. I can do this and I will not give up. Thank you for just the right “words of wisdom.” Support is a great thing. Very very much appreciated. Have a great day. Glad I read it……… thanks for putting it that way. This was an awesome message that all of us who struggle with clutter and the desire to be organized deal with on a regular basis. Your message was honest and uplifting! Thank you!!!! You are welcome, Brenda! Are you doing the declutter challenge? I think the Monday clean-up will go more smoothly with less stuff. It really is a miracle when we own less and everything has a definitive place to go, cleaning up, even dishes, takes so much less time! You are very welcome! I may understand how to be organized but I’m human with a laundry-list of other weaknesses, so I understand what it is to struggle and to feel like a failure. Just keep going! “Wherever you are, start there.” These are the words I need and will need. Thanks! EXCELLENT article Mary! Your system of decluttering is the only thing that has worked for me. This is my 3rd challenge and while I still have some things to tweak for the most part I am amazed (so is my hubby) at how the process has made life so much easier. Thank you Mary for sharing yourself with us. Thank you, Diane, you are such an encouragement to me. I am so blessed by you. Thanks for the reminder that this is declutter focused! My house and life will take time to feel good about. The purging process is only the one of the firsts on this journey of mine. My intention is: to narrow in on letting go of things, comparing myself and my progress with others, and becoming willing to believe that although I’m not making a 180 turn, but the compass is turning…any degree is progress. I think you maybe have turned 180, but it is just going to take a while to make your house turn 180 too. 🙂 Be kind to yourself. I started this journey with y’all & will have to finish it in a few months, as we are packing our home to move in just a few days. I’m so thankful for the fact that I did the challenge last years and cleared out quite a bit of stuff, but realize as I pack that I could probably do this 10 years in a row and STILL find things to let go of. I am decluttering as I pack, so that hopefully, setting up house in our next home will not be as challenging! Thank you so much for all of your inspiration and encouragement! I declutter every year and I did it every year for years before I ever did it on the blog. I think it is good to just accept that it is part of life, things coming in and things going out. 🙂 Good luck on your move! Thanks for this excellent word, Mary! It is a true principal not only of our physical homes and lives, but the way we feel about ourselves in general. Thanks for reminding us that slow, consistent growth is the best way to change our lives. If it makes any of you feel better, I’m still working on decluttering the kitchen. I keep plugging away a little at a time. Definitely not going to stress or give up. The entire house WILL be decluttered. Just at my pace. For the record…the laundry room is still looking fantastic! Mary, I could swear that you wrote this just for me! Lol. This is just how I feel. But I am not giving up. I’m creating good lifelong habits. Thank you! You just put everything back into perspective. I’m so glad you are focusing on the lifelong habits. Decluttering is truly something we will be doing for the rest of our lives, though it gets much much easier! I’m so glad this is working for you Janette! Just keep going, you are doing a great job! Thanks for your encouragement along the way. We have been needing to declutter for a long time. My husband and I are committed to this. We both work and can only do it on the weekends but we are following your tips and suggestions. It may take us all year but you have laid out a great plan. You are wonderful at what you do! Great post. I actually do a quick 5 minute straighten up each weekday morning. Not for anyone else, really just for me. I just feel better when the space looks put together. But, I don’t do it on weekends. I trained myself to do that because our living room is right off the entryway so when you enter the house, I didn’t want to see a messy living after a long day of working. The kids are teenagers now so keeping the house in somewhat of an order has been much easier. So the quick straightening up has gotten even shorter. Thanks for sharing your experience. Awesome post. Totally get it and agree. Your post came very timely! Last night our house looked like a tornado ripped through it. We had an unexpected death in our extended family and I’ve been on the go and out more than usual. We hired help to clean but I was still responsible to pick up. I got up at 2 AM to get things picked up, laundry folded, and dishwasher unloaded. Hubs is noticing the “pockets” of our home being de-cluttered but the middles don’t stay picked up so the whole house is a mess. so it feels like I’m spinning my wheels. And right now my laundry room is overflowing (the dirties actually buried the laundry baskets). Surviving during times of “crisis” is entirely different than normal maintenance, but the amazing thing is that as you learn normal maintenance habits, whenever a crisis happens, you don’t have to do a big catchup to get things back in order because your habits will get you there as you slowly re-start the motions. Remember that this year is a year of learning and you are doing the right thing by focusing on getting rid of the clutter! The laundry will work itself out, but you have to force the clutter out! Loved this article! No matter how much I’ve gotten done, I used to feel like a failure when there is still so much to do. You’ve probably heard this before…but you have kids growing up and that is temporary! Sounds like you have a healthy balance. My kids are grown and even though our family is still very close, some timeS I wish to have one day back of the “mess” and to be able to tuck them in bed one more time. My littlest is barely 3 and I still love cuddling him and reading him books at bed. Sometimes I think it would be nice to have my big girls little for just one night to remember how tiny and adorable they were at this age and to read them a book and put them in bed. All these phases are shorter than they feel.